What are your favorite hair tools to use? 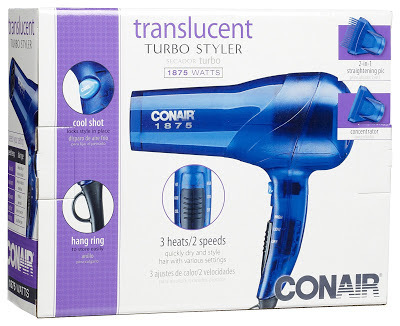 The Conair translucent Turbo Styler is the only dryer I use and I love it! I have been using this same dryer for a few years now, so appearantly it's the best. It comes with 3 heats (cool, warm, and hot) and 2 speeds (low and high) also it comes with 2 attatchment pieces (pic and concentrator). I use this dryer everytime after I wash my hair. But before I start using the dryer, I use my "Garnier Fructis Style Sleek & Shine Blow Dry Perfector Straightening Balm". Sometimes I do not need to use any other hair tools, because the balm and the blow dryer straightens my hair. If I do not want to use the pic piece, I take it off and replace it with the concentrator piece and along with it I use the brush and comb, pictured down below. I use a Ceramic Brush and a Wide Tooth Comb when blow drying my hair. First I use a wide tooth comb, because it is better to use when hair is wet. Honestly for me it's better to use either wet or dry. 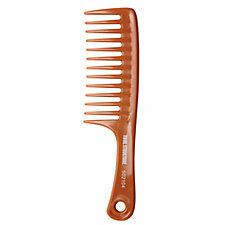 But when wet it is better to use this comb so my hair won't be pulled out, especially if tangled. So after I use the comb to dry my hair about 75%, I then use the ceramic brush to style my hair, if I do not feel like using the Instyler the ceramic brush is also good for me because it's an anti-frizz ceramic brush and my hair gets frizzy sometimes so I really like this brush . 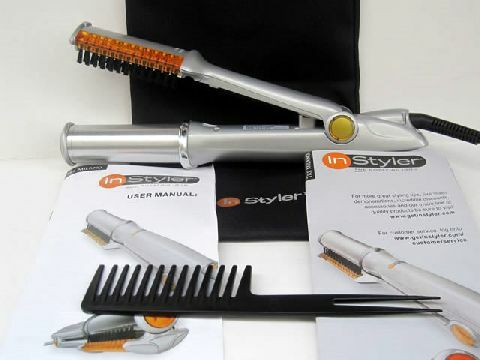 The hair tool pictured below is the Instyler and it is my miracle hair tool. When I am going out and I want my hair to look really nice (not saying that I ever want my hair to be messy) I use this. When I first saw the Instyler on tv which was about 3 year ago, I knew I had to have it. I needed a hair tool that worked good, because I was tired of using my flat iron. The flat iron I had left my hair clumpy and it looked horrible. So when I got the Instyler I was so excited and it wasn't even Christmas yet! I love it because you can use it many differnt ways... all of the instructions and ways to do your hair is all in the box. If you want to try it or your thinking about check out the commercial for it. Examples of what you can do with it are: straightening your hair, curling your hair, or flip your hair. The commercial is more detailed. Before I forget it comes with a comb. Everything is pictured below. These are the only hair tools I use right now, because I feel I do not need any other tools. If you have any questions feel free to ask, and check back for my reply! I don't use many things on my hair. I'm a little lazy! Great blog! I'm following your blog and I hope you will follow mine as well.